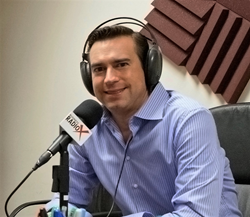 Healthcare IT News, a HIMSS Media brand and the industry’s authoritative source for health IT decision-makers, and acclaimed HIT advisor Justin Barnes, just launched This Just In @HIMSS, a groundbreaking radio event featuring select VIP guests broadcast live at HIMSS16. This Just In @HIMSS, sponsored by Citrix and Lenovo, is hosted by Justin Barnes, Founder of the weekly syndicated radio show This Just In. The premier HIMSS16 radio show will feature live interviews on the show floor with some of healthcare’s most acclaimed CIOs, CEOs, policy leaders and entrepreneurs. Watch and tune in to industry leaders tackling the biggest challenges and opportunities in health IT. This Just In @HIMSS kicks off at the HIMSS Media Booth #951, March 1-2 from 1:30-5 p.m. at the Sands Expo and Convention Center in Las Vegas. Dr. Farzad Mostashari, MD, CEO, Aledade, Inc.
Healthcare IT News, a HIMSS Media publication, is the industry’s authoritative source covering the people, policy and technology driving next-generation healthcare in the U.S. For more than 12 years, it has been the leading voice of health IT, delivering strong and unbiased editorial insights on compelling topics such as electronic health records, health information exchange, privacy and security, data analytics, patient engagement, population health and revenue cycle management. Healthcare IT News’ audience spans across all media platforms and reaches some 54,100 qualified print subscribers and has more than 240,600 readers for print and digital products. For more information, visit HealthcareITNews.com. This Just In is a weekly syndicated radio show that focuses on the latest trends impacting our nation’s healthcare, economy, innovation and opportunity. The host, Justin Barnes, aka @HITAdvisor, is an entrepreneur and corporate advisor. He’s a former executive with Greenway Health, McKesson and most recently, an entrepreneur-in-residence at Georgia Tech’s Advanced Technology Development Center. Whether it’s a trending topic or the “next big thing,” Justin is sure to be talking about it with his broad circle of peers. You can listen to This Just In on the Business Radio X network (ThisJustIn.BusinessRadioX.com) and the Healthcare Now Radio network (HealthcareNowRadio.com/Programs/This-Just-In). HIMSS Media is the fastest growing B2B media group focused exclusively on healthcare and technology markets. Through its suite of market-leading brands, such as Healthcare IT News, Healthcare Finance and MobiHealthNews, HIMSS Media delivers news, analysis and must-have information to an audience of senior healthcare and technology influencers. HIMSS Media is also the leading producer of important live events, such as the Privacy & Security Forum, Patient Engagement Summit, Revenue Cycle Solutions Summit and Big Data & Healthcare Analytics Forum.